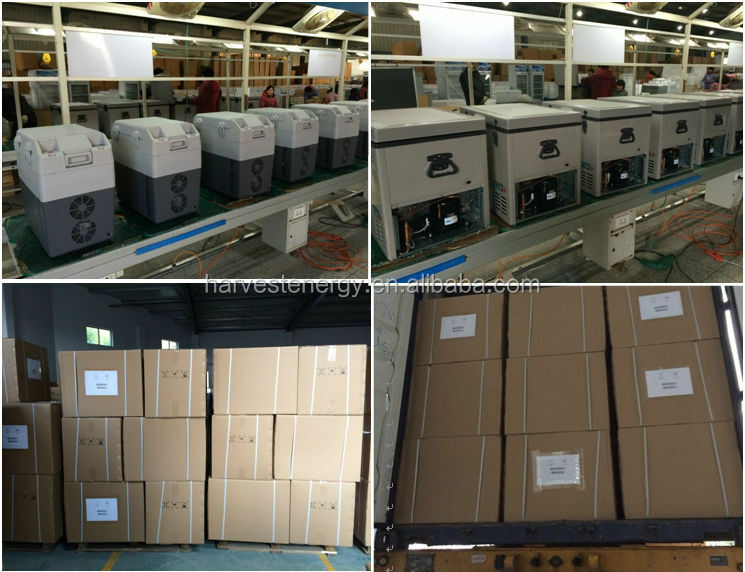 Custom and Cheap Car Fridge Manufacturer 60L,70L,80L 24V/12V portable mini car refrigerator Supplier and Manufacturer.--Qingdao Harvest Energy Import And Export Co., Ltd. Custom and Cheap dc solar fridge system,dc wind solar hybrid system,AC showcase refrigerator,patented washing machine absorber,patented Washing machine feet Supplier and Manufacturer. 1. Latest ultra efficient German technology compressor. 2. Can run on 12V/24V DC and 220V/240V AC. 3. Can set temperature from an ice cold -19°C and up to +10°C. 4. Perfect for tropical climate, can even refrigerate in blistering hot temp up to 50°C. 5. Digital temperature pre-setting and LCD display with failure prediction show. 6. Automatic power cut off at 10V to protect the battery. 7. Cabinet coating made of pre-coated steel. 8. Anti-vibration design for harsh condition. 9. Heavy duty alloy body, latches and handles. 10. High level of insulation, 55MM polyurethance foam. 12. Suitable for solar power supply operation. 13. Use for camping&outdoor, car, 4WD, motorhomes, RV, caravan, truck, automotive,boat, marine,home. 14. Two years warranty for compressor, one year for everything else.